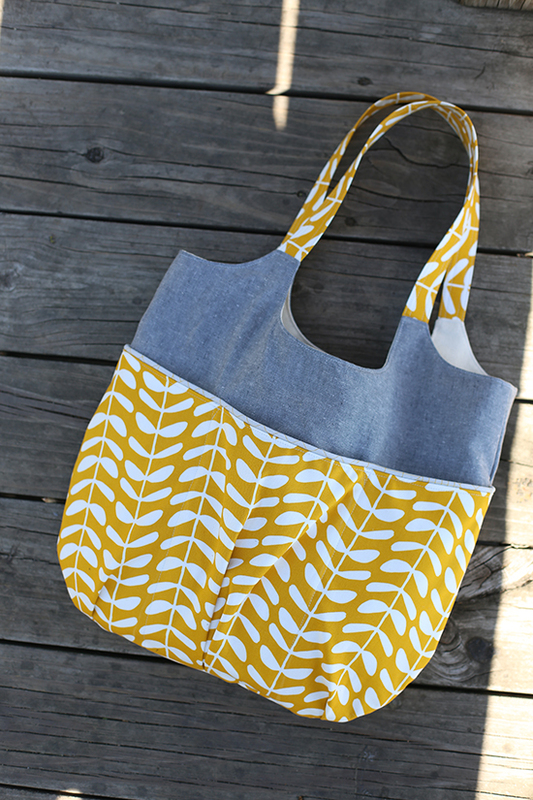 Go Anywhere Tote Bag Pattern by Noodlehead - Just Gorgeous! Hey there all you intermediate and beyond sewists! 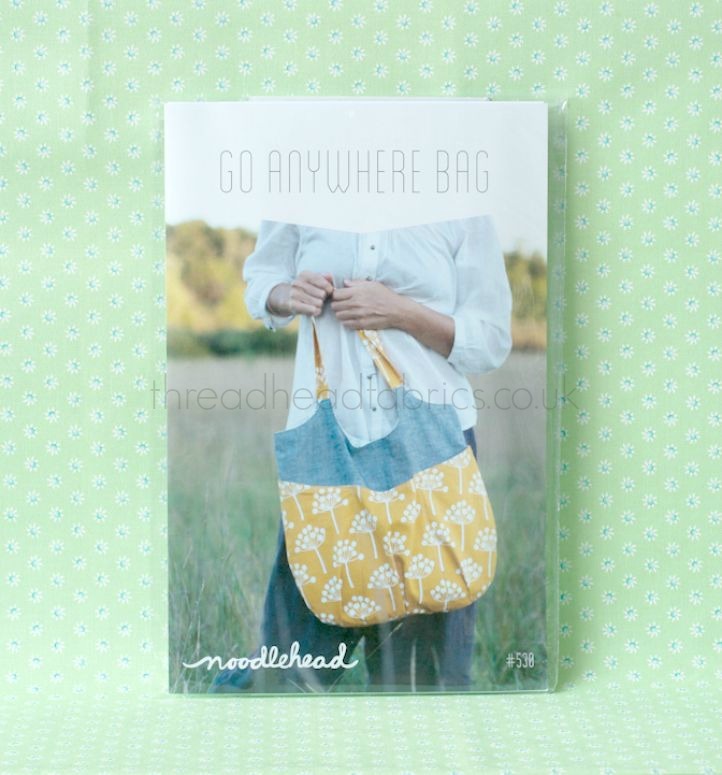 Noodlehead has created this gorgeous Go anywhere Tote Bag pattern with you in mind! 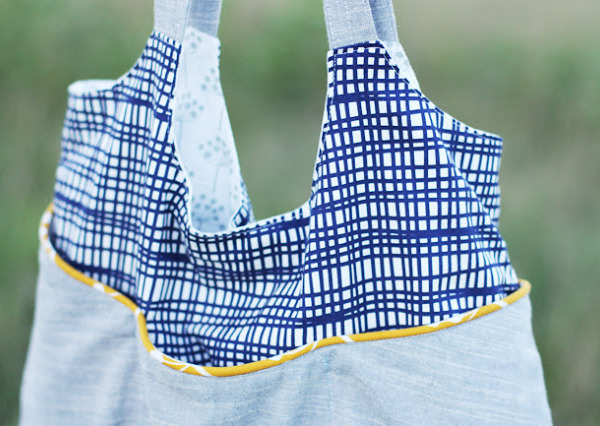 With soft pleat detailing, loads of pockets to help keep you organised, optional piping and magnetic closure, this roomy but not too big tote bag will make you want to bust into your fabric stash and pull out some of those special designs you’ve been hanging onto for that perfect project! 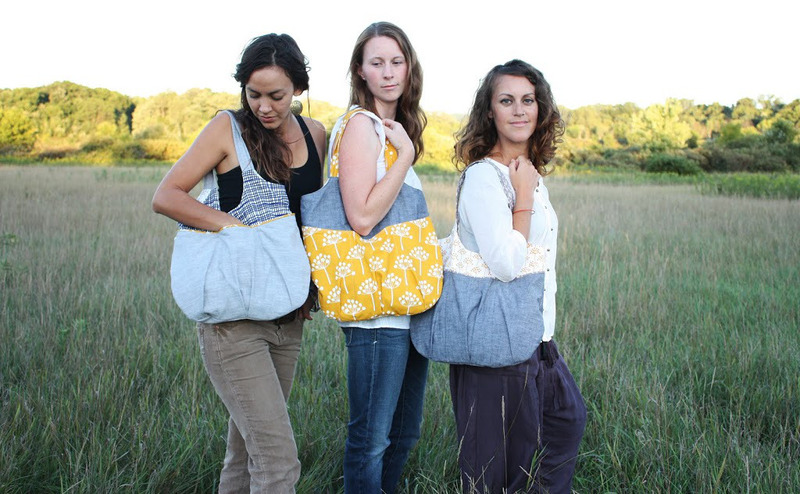 Noodlehead’s designer, American Anna Graham takes you through every step so you can create a gorgeous Go Anywhere Bag of your own. You may find it hard to stop with making just one! 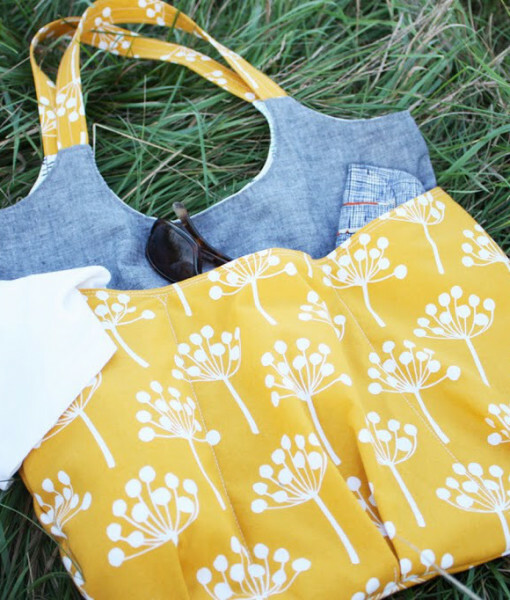 You’ll want to make enough to go with your favourite outfits and several for each season! 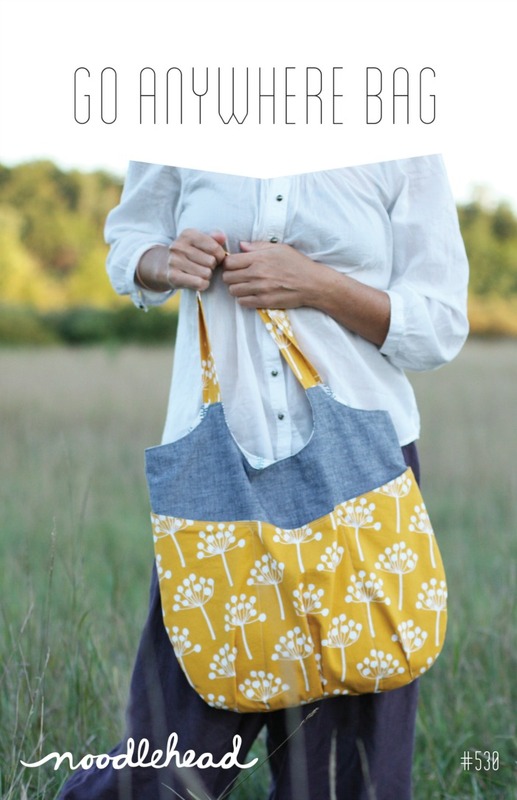 Lovely Anna truly pays it forward by giving permission for you to sell your finished products created from her patterns. Pretty cool, huh? 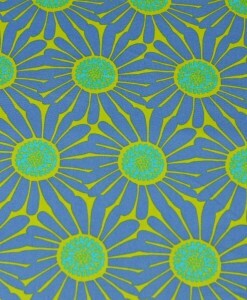 Not all pattern designers offer this. So go ahead! 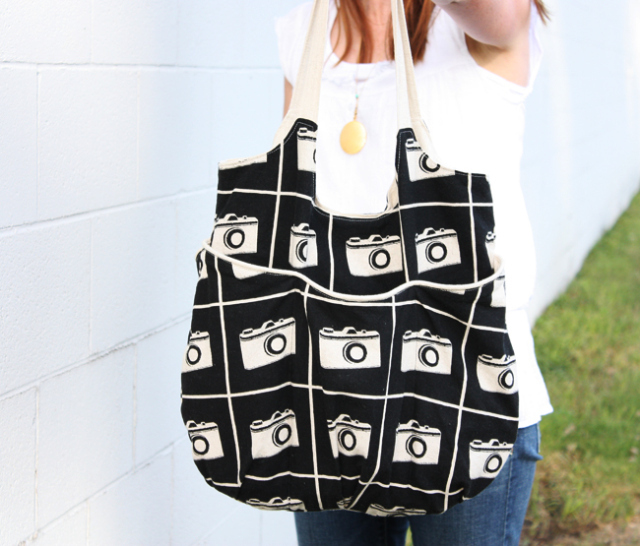 Get carried away and make several so you can try your hand at selling your creations! 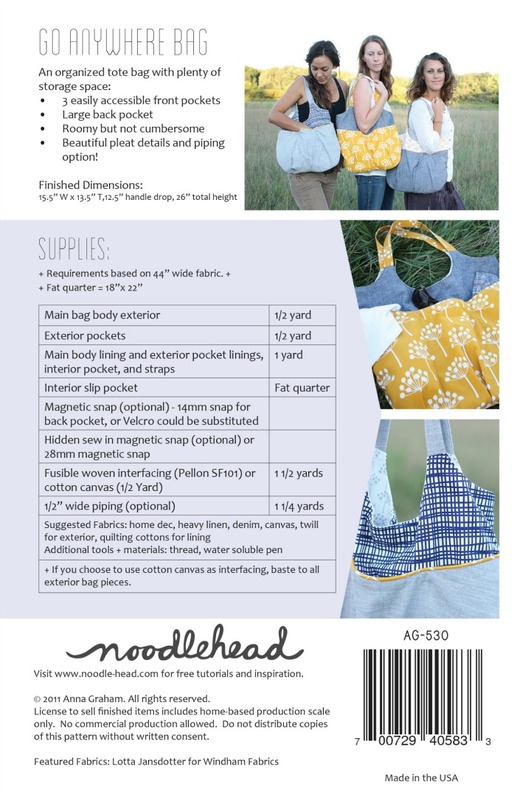 Noodlehead recommends using heavy linen, denim, canvas, twill, or home decor weight fabrics for the bag exterior and medium weight quilting cotton for the interior. 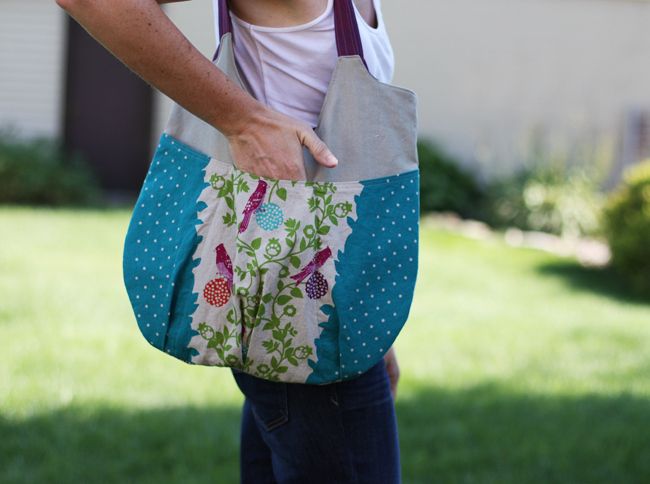 The finished bag is 15.5 inches (39.4 cm) wide x 13.5 (34.5cm) tall and 12.5 inches (32 cm) handle drop. It is 26 inches ( 66cm) tall including the strap. Off to the market for some shopping or off for an overnight stay at your favourite spa? 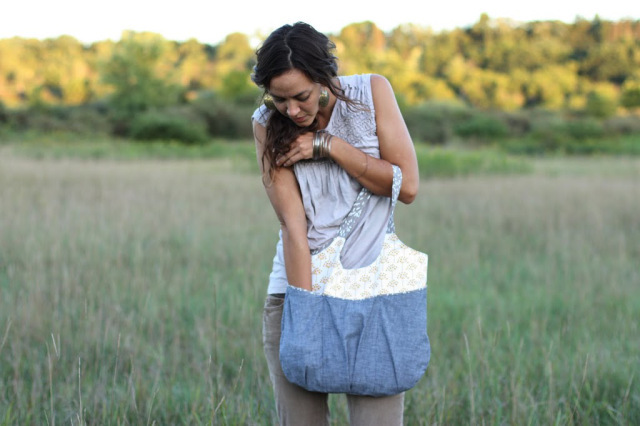 This could be the perfect bag to grab for those times when you want a bag that is a bit larger than your regular bag, but not so huge that it becomes awkward to carry. 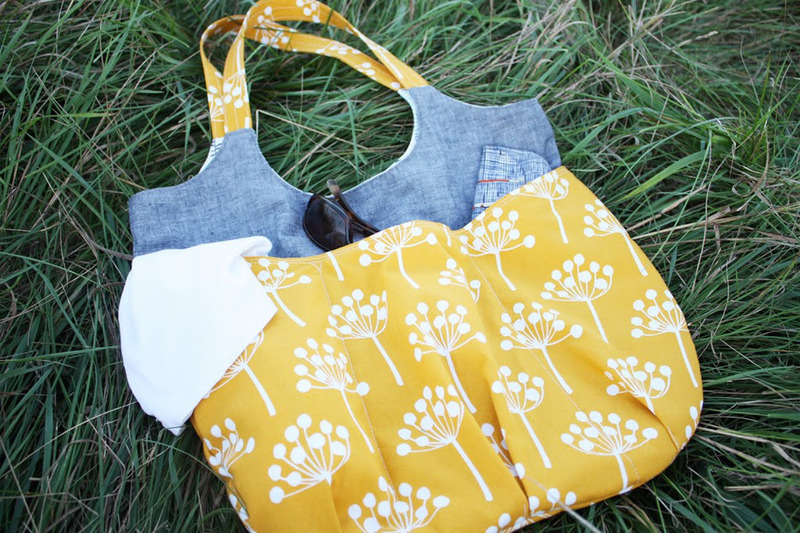 This fab bag has five, count ’em, five, pockets to keep your gear neatly organised. 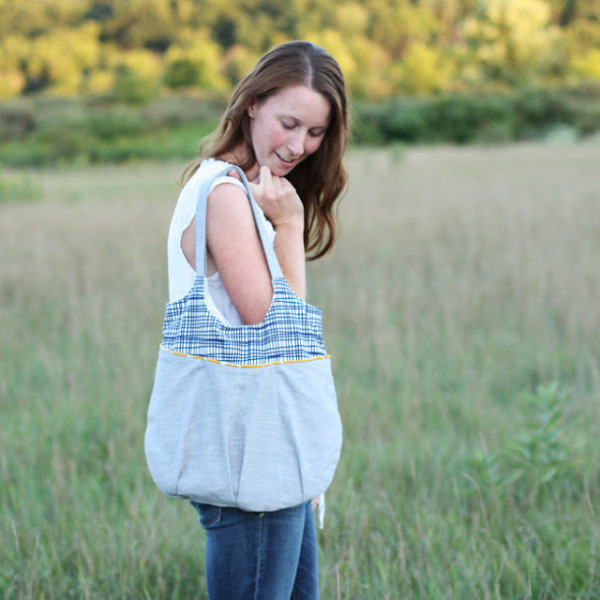 There are three pockets on the front exterior, one big one on the back exterior and one on the inside. You can never have too many pockets!! 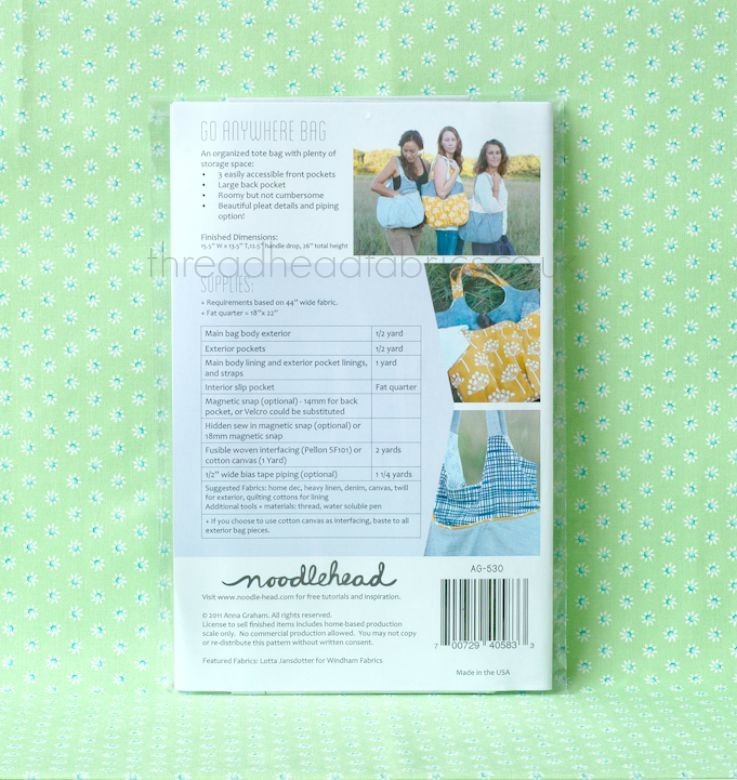 Noodlehead patterns are the creation of lovely Anna Graham. Multi-talented Anna is not only a pattern designer. 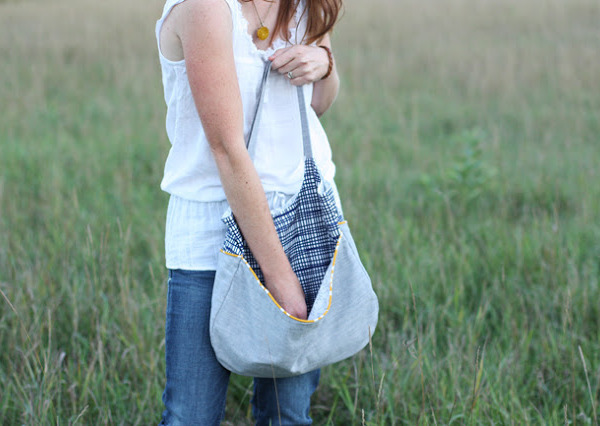 She is also an author, a shining new star in the fabric design industry and one cool blogger! Noodlehead gets its name from a nickname for one of Anna’s curly-haired daughters. How cute is that? 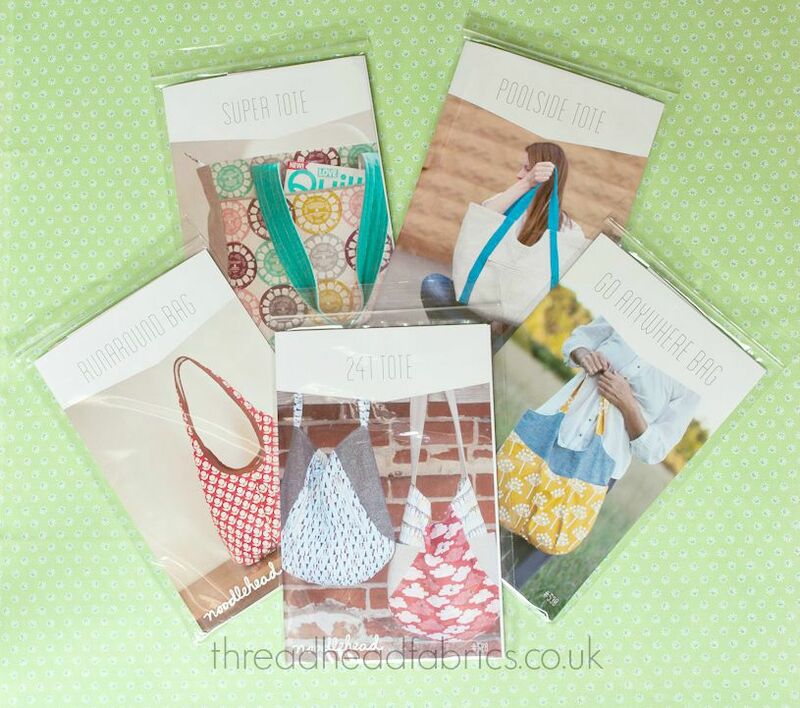 She has created a whole lovely assortment of bags so don’t be surprised if you want to make others once you created one! 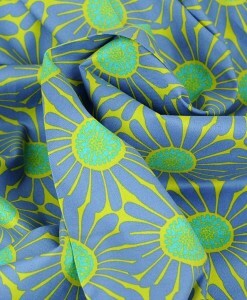 Fabric amounts are based on using 44 inch (112cm) wide fabrics.